This three-pack of mini springform pans is perfect for creating mini cheesecakes, quiches, deep dish pizzas and more. 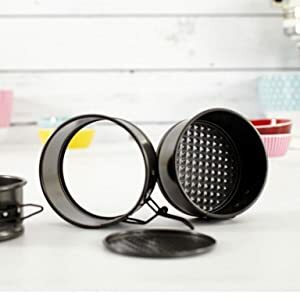 Specially designed for making cheesecakes and tortes, the springform pans have sides that spring free from the base, releasing desserts without breakage. Non-stick pan easily release, and offers quick dishwasher safe cleanup. Springform clamp opens sides of pan and releases food easily.